Following the success of the $500 entry semi-pro shootout at the corner bank on the weekend of April 23rd. 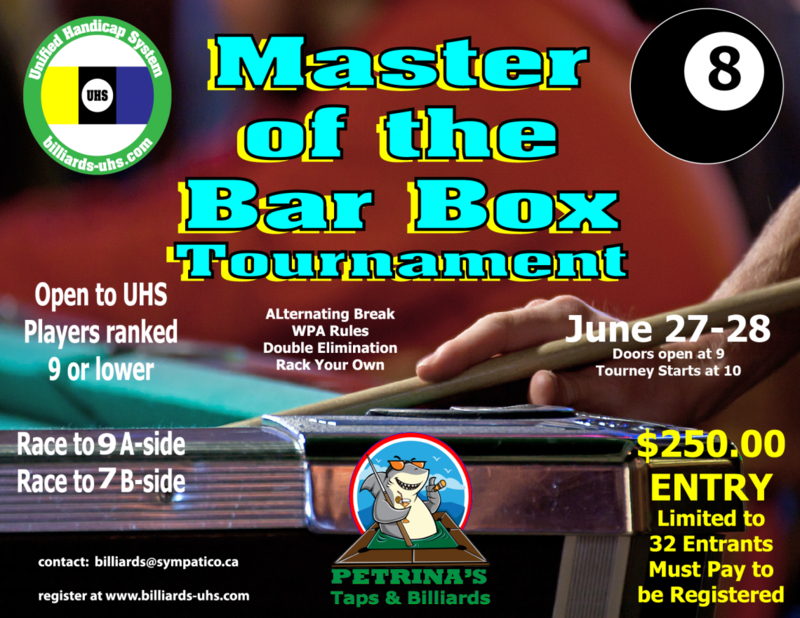 Petrinas billiards in Ajax, Ontario has announced another high entry tournament this time the action will be on the bar table. Scheduled for June 27-28 the format will be 8 ball, alternate breaks, race to 9 on the winners side and race to 7 on the losers side. The field is limited to U.H.S handicaps of 9 and below and will be played on Valley tables with Simonis cloth. Entry is $250 and with a projected field of 32 players this will bring the prize fund to $8000. This will be another great chance for players from Ontario to take a shot at a healthy prize fund, hope to see you all there. Rooms are welcome to organize qualifiers to help offset the cost of the entry, any inquiries are welcome to contact Frank Kakouros on Facebook or through Petrinas billiards.